Citation Information: JCI Insight. 2016;1(21):e90341. https://doi.org/10.1172/jci.insight.90341. Duchenne muscular dystrophy (DMD) is a devastating muscle disease characterized by progressive muscle deterioration and replacement with an aberrant fatty, fibrous matrix. Chronic upregulation of nuclear factor κB (NF-κB) is implicated as a driver of the dystrophic pathogenesis. Herein, 2 members of a novel class of NF-κB inhibitors, edasalonexent (formerly CAT-1004) and CAT-1041, were evaluated in both mdx mouse and golden retriever muscular dystrophy (GRMD) dog models of DMD. These orally bioavailable compounds consist of a polyunsaturated fatty acid conjugated to salicylic acid and potently suppress the pathogenic NF-κB subunit p65/RelA in vitro. In vivo, CAT-1041 effectively improved the phenotype of mdx mice undergoing voluntary wheel running, in terms of activity, muscle mass and function, damage, inflammation, fibrosis, and cardiac pathology. We identified significant increases in dysferlin as a possible contributor to the protective effect of CAT-1041 to sarcolemmal damage. Furthermore, CAT-1041 improved the more severe GRMD phenotype in a canine case study, where muscle mass and diaphragm function were maintained in a treated GRMD dog. These results demonstrate that NF-κB modulation by edasalonexent and CAT-1041 is effective in ameliorating the dystrophic process and these compounds are candidates for new treatments for DMD patients. NF-κB components are elevated in stabilized mdx muscle. 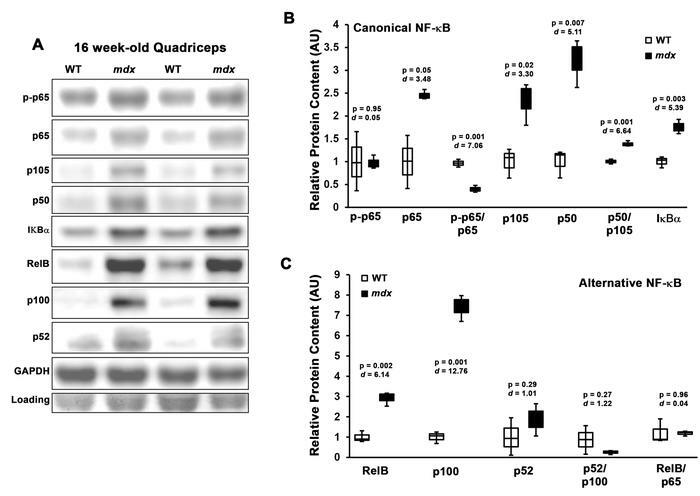 (A) Representative immunoblot images of 16-week-old WT (n = 3) and mdx (n = 3) quadriceps with accompanying quantifications for (B) canonical and (C) alternative NF-κB component protein levels. Protein levels were normalized to Ponceau red–visualized loading (Loading) and quantified relative to WT values. Data are displayed as box-and-whisker plots, indicating first and third quartiles, median, minimum, and maximum values, and were analyzed using 2-tailed Welch’s t test with effect size displayed as Cohen’s d.